Makita 18v 115mm DGA452Z Cordless LI-ION Angle Grinder Lithium Ion BARE UNIT - Includes Makpac Case INCLUDES Metal Cutting Abrasive Wheel. 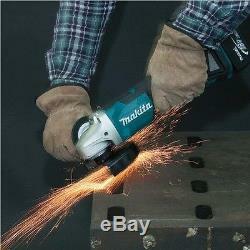 Description: The Makita DGA452 is a powerful 115mm mini angle grinder with safety and comfort features as standard, powered by the Lithium-ion batteries, this grinder fits in with the vast range of Makita Li-ion tools. The DGA452 is ideal for small scale cutting and shaping of bricks, paving slabs, and roof tiles, cutting slots and chases in walls. This machine also offers fast cutting through metal bar, sheet, angle etc. Features: Voltage 18 V Wheel size: 115mm Diameter Spindle Thread M14 No Load Speed: 10,000rpm Net Weight: 1.9kg Includes: Side Handle Metal Cutting Abrasive Wheel Makpac Carry Case No Battery or Charger Included. 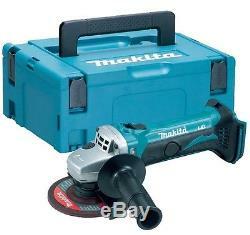 The item "Makita DGA452Z 18v 4.5 115mm Angle Grinder Lithium Ion Bare Unit + Makpac Case" is in sale since Monday, February 08, 2016. 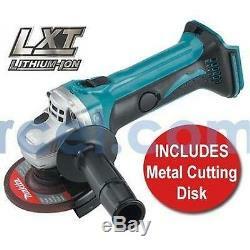 This item is in the category "Home, Furniture & DIY\DIY Tools\Power Tools\Grinders".